and Abilities in a Martial Art? Are you looking for new ways to train, improve and teach your skills and abilities? Are you looking for a unique way of understanding what you practice and teach, or the martial world in general? If so you have come to the perfect place. Here you will find basic, simple, and comprehensive tools that will put order and give understanding to any system or style. In short, you can save your valuable time to train more efficiently and get better results. Whether you are training for self defense, street fighting, MMA , tournaments, fun, health or otherwise, you will be able to concentrate your efforts, time, sweat and sometimes blood, to whatever it is you want to achieve. We will help you to find, define and focus your goals making them manageable and attainable so you can realize them more efficiently. And even if the goals change along the way, you will still have the right tools and understanding to make the correct adjustments in your training. There are many ways to train these aspects: Meditation, hypnosis, endurance exercises, fasting, “tortures”, ect... It’s important to remember that this component, in its most basic definition, isn’t meant to improve our lives, or turn us into better people (although if this happens its great). Its primary and most important goal is to teach and train the state of mind that a warrior\fighter needs to obtain in a battle/fight. The physical component is everything that has to do with the physical part of the warrior\fighter – physical strength, power, explosiveness, quickness, agility, reflexes, flexibility, cardio\stamina, physical endurance and more. It is important to remember that this component, in its basic definition, is not meant to improve our general health (although if this happens it’s great), but to give our body the physical conditioning it needs for the battle/fight. For example, a boxer will not devote as much time as a takewando fighter to gaining flexibility in his legs although it might benefit his overall health; A street fighter will not work on his cardio as much as a boxer, although, like before, his health might benefit from it. 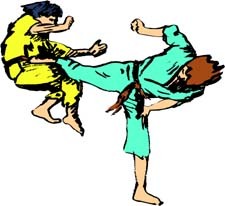 The technical component includes everything that has to do with developing the weapons (punches, kicks, submission holds, elbows,joint locks...),use of weaponary, techniques, timing, responses, etc, of the specific martial art. Here, also, there are countless methods for training – heavy bag work, speed ball, pair work, pad work, and much much more. A good punch is not only technical but also physical. * Mental – Not to be afraid of the hit, even if we didn’t manage to avoid it. * Physical – If we didn’t manage to defend the hit it helps us to train our physical endurance, and if we did, we do it through improving our quickness, agility and reflexes. 5. Method of training and assimilation. And the third part: What is victory? – What are our goals in the fight – Killing? Controlling?, To knock unconscious? Do we want or are we willing to cause permanent damage? If our opponent will have a sword, we must learn and train, first, using a sword or a better weapon (gun, etc). If he will have armor protection, it will be less effective to give body shots, and maybe we should concentrate on locks and choking. If we’re going to fight on the streets, do we want to avoid the ground fight as much as possible? On the ground will we be able to respond effectively to more than one opponent? Will we be more vulnerable to eye gouging and groin attacks? If we’re in the boxing ring and we know we cannot be taken to the ground, can we “allow” ourselves to throw a punch with all our body weight? In general, what are the limitations of our battle\fight definition and conception? And what would be the best situation that will give us the best opportunity for winning? 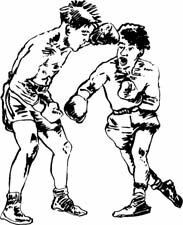 For example: In boxing if we’re facing a taller opponent, our tactics would be to get to a closer position so that our punches can easily reach him, but his are less effective. Of course the opposite is true, if you’re the taller boxer. If it’s a mass fight, our tactics might be to get to a position where the majority of our guys are fighting their minority (the narrow side). If there is a door/entrance, we might attack the people just as they are coming out. In general, the tactics include, whatever we decide to do in a specific situation before the actual contact. How do we move in a manner with which we can control our opponents movement? For instance "cutting the way of movement”. What kind of weapons do we have for close range fighting – elbows, uppercuts maybe biting or head butting...? And how do they need to be delivered so that they can be most effective? How do we take a larger opponent to the ground? 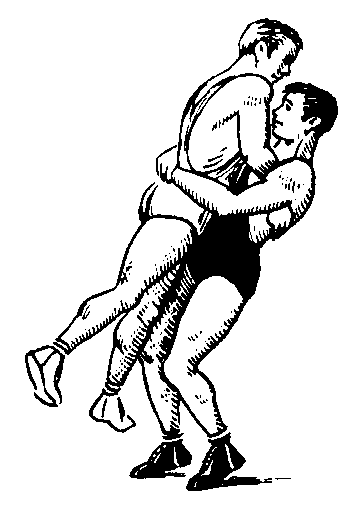 How do we make an effective arm lock? If we have a sword, what kinds of cutting and stabbing techniques? How do we execute them? How do we control the fighting distance? The theory of technique answers five basic questions: what, where, when, how and which. The way with which we assimilate the components we have decided that a warrior/fighter needs, so that it becomes his innate behavior and response during a battle/fight! The system or method must train the three components from Part 1 – Mental, Physical, Technical - and assimilate them into the warrior/fighter. What is our goal and are we on the right path to achieving it through our specific martial art, and/or through the way that we are training it? Now we have a tool to help us choose what's right for us! Now we can take whatever we need, from any system, to help us reach our goals!! This is the blueprint of any complete martial art. This site is designed to be a reference source and not to be read from front to back. Read the articles and information which intrests you. Some of the subjects are written in length and some are in short, but remember that appearance doesn’t matter – quality does – We want to give you a reference guide to help you train, not a book to sit and read for hours. Feel free to respond, to any of the information presented in this site through our contact us. We believe that everyone has valuable information that can enlighten us as well as the rest of the visitors and members. A martial art is not sacred - it’s a way, a path for you to achieve your goals and realize your full potential. How can you develop and reach your potential without understanding the way? Now you have a map that will lead you along the path of the warrior, and will help you decide where to turn and when and where to keep going straight in order to reach your destination. Using these tools will enable you to become the warrior you want to be!! I promise to use it only to send you The Warriors Project - Tips & Drills E-zine.